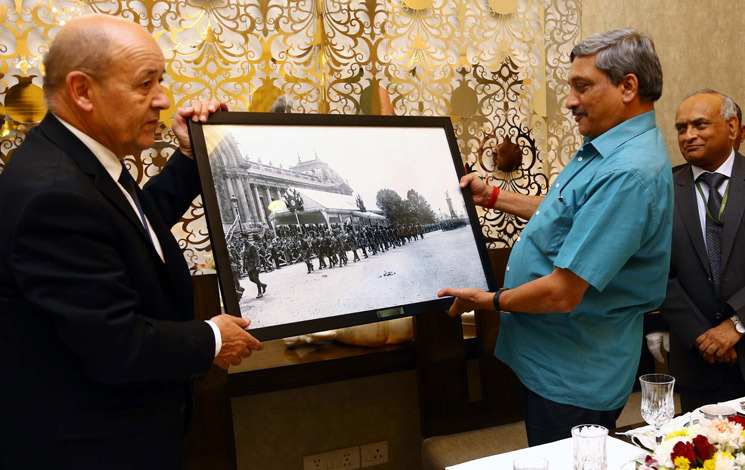 French Defense Minister Jean-Yves Le Drian presenting a framed photograph of Indian soldiers during World War-I as a memento to his Indian counterpart Manohar Parrikar in New Delhi. India's Defense Secretary R.K. Mathur is also seen at extreme right. NEW DELHI: When French Defense Minister Jean-Yves Le Drian visited New Delhi on Dec. 1, 2014 for a sales call, did he get a cold-shoulder from his Indian counterpart Manohar Parrikar? Read the signals: Guard of honour called off for the visiting dignitary, and talks pushed to a half-hour slot in the evening, not in a South Block conference room, but the informal confines of the Navy Mess at Kota House in the heart of capital New Delhi. Le Drian's agenda was limited but transparent: he wanted to pitch for the Rafale and Maitri SRSAM deals with the new Indian Defense Minister, and strongly pitch for early contracts. Just beginning his journey down the slippery and often treacherous road along the arms bazaar, Parrikar appeared cautious, not wanting to be seen as too eager to cozy up and submit himself to a sales pitch. Hence the levity about the treatment to this visit. Parrikar received the visitor, but did not vest the occasion with the seriousness and protocol generally associated with visits of foreign defence ministers. Generally, an inter-service guard of honour is presented to a visiting defense minister, and one was accordingly scheduled at the South Block lawns for Le Drian on the afternoon of Dec. 1. But it was called off after Parrikar conveyed his unavailability. The Parliament session was a handy excuse. Also, he's returned from Goa, his home state, the same day. As a host, India's defense minister is required to be present at a guard of honour for a foreign counterpart visiting India. Technically, protocol would have been observed even if Parrikar's deputy, Minister of State for Defense Rao Inderjit Singh had showed up in place of him. But a decision was taken to cancel the guard of honour. In protocol terms, the French Minister had to be content with laying a wreath at Amar Jawan Jyoti on Dec. 2, 2014, before he flew out of India. He also visited Vivekananda International Foundation or VIF, which now appears to be ‘a Must' on the itinerary of every weighty foreign dignitary. Scheduled immediately after a half-hour delegation-level at Kota House was a courtesy dinner, where senior defense officials were also present. Immediately after the meeting, it was conveyed by the Ministry of Defense to news hounds that Parrikar had assured the French of putting the pending arms deals on fast track, including the one for the 126 Rafale combat jets. So, Parrikar was business-like to a valued defense supplier, but not over-friendly, as he goes about setting the right equation with the arms bazaar in the early stage of his tenure. He began his tenure on Nov. 10, 2014 with the declaration that military procurements under him would be transparent but swift. 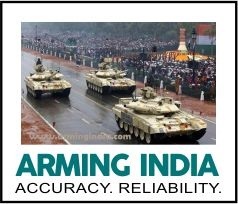 He was addressing himself to concerns about the long period of drift and delay during the previous UPA government's 10-year tenure in half-hearted efforts to modernize India's armed forces.